This book first explains utensils, the art of combining dishes in menu-planning, and preparing, offering and eating an Indian meal. 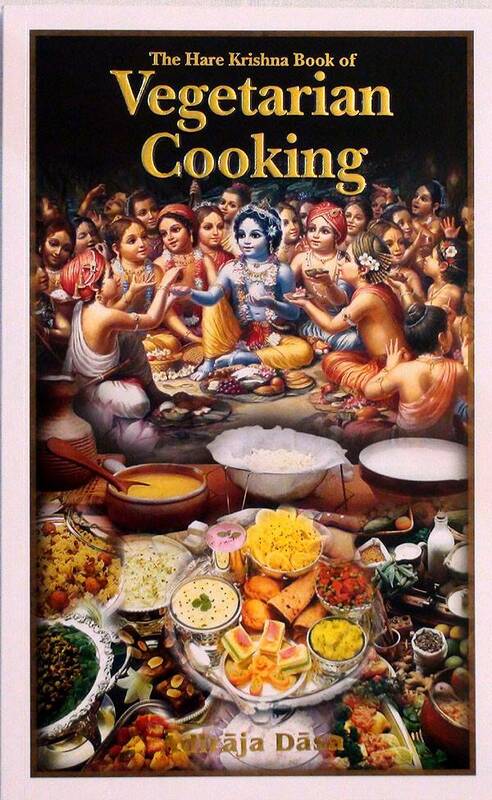 Then come 120 tested recepies, carefully chosen by the best cooks in the Hare Krishna movement for their diversity and ease of preparation. Preface by actress Hayley Mills. This book first explains utensils, the art of combining dishes in menu-planning, and preparing, offering and eating an Indian meal. Then come 120 tested recepies, carefully chosen by the best cooks in the Hare Krishna movement for their diversity and ease of preparation. A colourfully illustrated, practical cookbook that not only helps you prepare authentic Indian dishes at home, but also teaches you about the ancient tradition behind India's world-famous vegetarian cuisine. In 1971, after receiving his masters degree from New York University, Adiraja Dasa left the United States for the Orient to pursue his twin interests: Spirituality and exotic cooking. Three years later, in India, he heard about an Indian system, where cooking, like all other activities, can be perfectly integrated into ones personal spiritual life. In 1975 he met the devotees of the Hare Krishna movement in Switzerland and became an active member. Adiraja?s next project is to move to England where he plans to popularize the arts of cooking Indian by opening a cooking school in London and organizing free spiritual-food distribution programs all over the country. If you would like to correspond with him about the subject matter of this book, write; Adiraja dasa, 10 Soho Street, London W 1, England. This is one of the best books we have on our shelves. The recipes are fool proof and have a most wonderful collection. The Hare Krishna movement is known for their mind blowing food which you send you into food Nirvana. Cucumbers are at their best when they're about 10 inches (25 com) long, firm, bright green, and shiny. If the skin is tough, you can peel or score it; if the seeds are large, it will be worth the extra time to scrape them out. Dry-roast the cumin seeds and grind them into a powder. Wash the cucumbers and grate them through the large holes of a metal grater. Squeeze out the excess liquid and combine the grated cucumber with all the ingredients in a mixing bowl. Toss. Serve chilled. Chop the washed and drained spinach leaves into small pieces. Heat the ghee in a saucepan over medium heat and fry the powdered spices. Put the chopped spinach into the saucepan with the 3 tablespoons of water. Cover, and cook gently until the spinach is tender. This should take about 10 minutes. Now fold in the cream and the cubes of paneer. Add the salt and sugar, stir well, and continue cooking over the same low heat for 5 more minutes. Serve paneer sak as a main dish with rice or hot chapatis or both.